Our guard house bullet resistant arrive totally assembled, ready to set, connect, and use! Welded steel construction to give you the strongest building on the market! 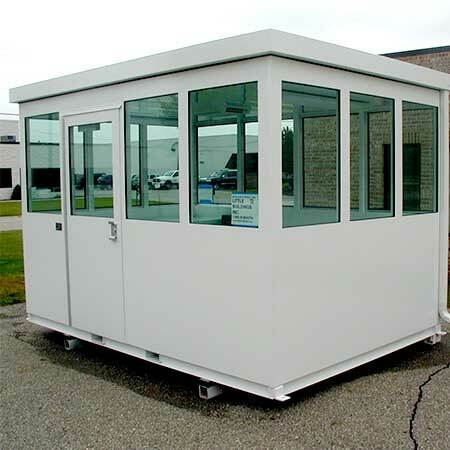 Choose a hardened guard houses as small as 4'x6' or select larger units up to 11'x40'! 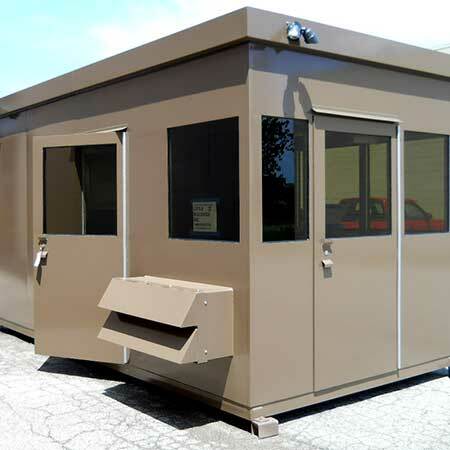 Whether used for a guard hut, Portable Armored Guard Building, Over Watch Control Booth, or an Access Control Point, Little Buildings can build it for your! While terms like " bullet proof guard house" or "Bullet Proof Guard Shack" are commonly used, "bullet resisting" followed by a level of resistance is proper as there is no such thing as totally bullet proof. Many levels of bullet resistant security offices are available from U.L. Level I through U.L. Level VIII as well as portable steel buildings to meet NIJ bullet resistant parameters. Our most popular is our Level III guard house. Add a built in restroom for full time installations. Contact a Little Buildings, Inc. representative to request a chart showing bullet resistant threat levels for reference. Standard ballistic guard shack glazing, 3" canopy overhang, 4" elevated base , steel work counter with storage drawer, insulated walls and ceiling, treadplate floor, anchor tabs, and lifting ring(s) in roof. Electric features include fluorescent light with lens and wall switch, electrical outlet with GFI protection, wall mounted electric heater with fan and integral thermostat, and wiring to a wall mounted circuit breaker box with main disconnect. Some optional bullet resisting guard house items include bullet resisting roof and floor, additional doors, pass-thru windows, gun ports (common in Level 8 guard house), rubber tile floor, insulated floor, elevated stands, trailers, additional counters or shelves, custom cabinetry or gun lockers, and tinted glazing. Common electrical options include wall or roof mounted air conditioners, larger heaters, phone and data jacks, dimmable lights, sirens, strobe lights, magnetic card reader door locks, and exterior flood or spotlights. Our bullet resistant guard house and hardened guard house have been used by all branches of the U.S. Military as well as Professional Sports teams, Pharmaceutical Companies, and courthouses to name a few. 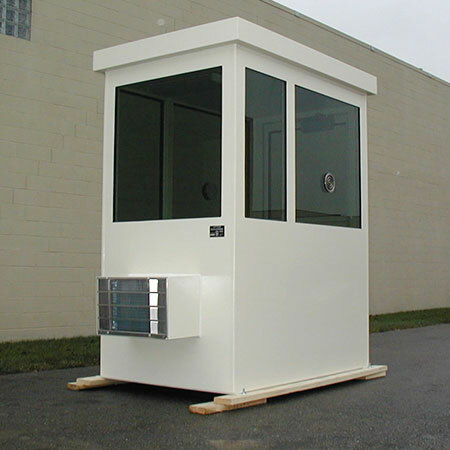 Choose one of our standard Bullet Resistant Security Booth or armored guard room models and modify it or let us work with you to create exactly the right bullet resistant guard booth to meet your requirements. 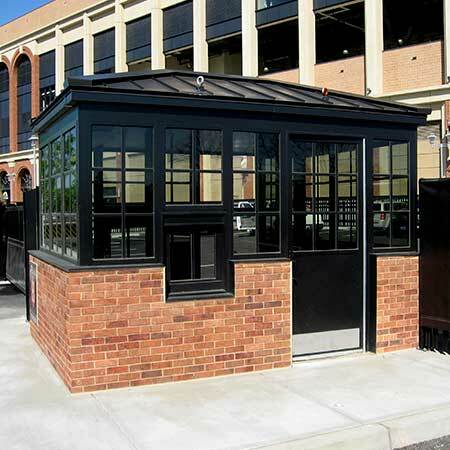 Level III bullet resisting guard shacks are our most popular but we also manufacture Guardhouse bullet resisting Level VIII for high security government, utility, and private installations. Contact us now by email at (click to email) or call us toll-free at 1-888-55-BOOTH (1-888-552-6684) or 1-586-752-7100 to discuss your needs with one of our specialists! Little Buildings reserves the right to modify or improve models and features without notice. Photographs may include features and equipment that are optional extras. A sketch of your building will be provided for approval.